A commission done for GregXB a year ago. I finally got the go-ahead to post it. They make their first appearance in this story: www.fanfiction.net/s/12799753/…. 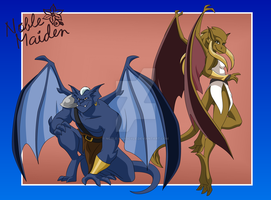 They may also make appearances in Gryphinwyrm7 and Algernon-X's stories. They are Coyote, Hyena, Wolf, Jackal, Tazmanian Tiger and his thylacines. No importa que tipo de mejoras tengan o que nuevos miembros se unan, van a seguir siendo un saco de boxeo para las Gárgolas xd. Pero de todas formas se ven geniales. Buen dibujo. I've been trying for years to find the comics. I got a couple of issues, but not enough to get the whole story (or at least as much as came out before cancellation). WOW! I never was that big on the Pack after they 'upgraded' themselves, but now they really have improved for the better. I am impressed. Wow, they look badass. But who's Tazmanian Tiger? He's a villain from the Bad Guys comic. I see, dude means business. 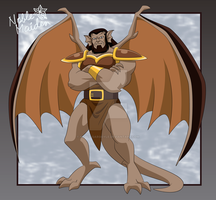 He makes his first appearance in the Gargoyles: Bad Guys comic book. Go to GargWiki to find out more about him. So let me guess. Coyote's on his way to becoming an independent A.I., Wolf is magically enhanced with Nordic black magic along with ditching any subtlety by going all in on the werewolf schtic, Jackal seems to have been touched by the deathly essence of Anubis again, Hyena's ramped up her bloodlust with....ACTUAL bloodlust and become some kind cybernetic vampire, and the new kid on block Tazzy here like his also Australian predecessor, respected his body and mortality and got himself some fancy hi-tech armor instead, provided of course by Xanatos Enterprises along with his upgraded pet Tasmanian tigers. Y'know I'm starting to wonder how Fox tolerated these nutcases even before they decided to full horror movie and I hope Alexander doesn't have a genetic predisposition towards supervillainy if these are supposed to be his "role models" given that the Ultra-Pack are mommy's former coworkers, cause lord knows they don't need a reality warping magical fae child who might be wearing the Fox mantle soon enough. Ugggh. Scary thought. Just did and this dude means business. They look as dangerous as always! Even a bit more psychotic. Also because Jackal's got the power of Anubis in him again, I'd say that this is Omega Pack rather than Ultra Pack! I mean they basically got even More Power to them! Daaaang son! This is super awesome! But Still, As A Pack Fan, This Is AWESOME! I don't want a reboot. I want a continuation.